Happy Tuesday, everyone! I was going to write Monday instead. I had a stat holiday on Monday and now my days are mix up. This card is almost one layer card but I can't seem have no layers on my card. I did the faux tearing technique for this card. The Watercolor Trio stamp set is perfect to make this kind of card. No colouring involve. My favourite kind of set. Hello, everyone! Happy Friday! It is our civic holiday long weekend this week. We are not going anywhere or doing anything special for this long weekend because DH have to fly to Calgary for a funeral. I'm hoping I'll have a chance to make more cards to show you. Aren't these flowers beautiful? I love them but not sure what kind of flower it is. This stamp is from the Elements of Style stamp set from the Summer Mini. I add some Dazzling Diamonds on a flower where the sentiment is. Can't really see it that well. It is kinda blurry. My camera lens is broken. It doesn't do auto focus anymore so I have to focus the picture manually. You can tell I'm not to good at focusing it manually. Thank you for visiting today and have a wonderful weekend! Happy Thursday! Ice cream anyone? I love ice cream. This is a new Sweet Scoop stamp set from the Summer Mini catalogue. What a fun stamp set to have especially for making birthday cards. Kids will love it when you give them an ice cream hand stamped birthday card. I know my kids will cause they love to eat ice cream so much. Always ask for ice cream when we go out and after supper. Look what my blogging friend Helen award me! 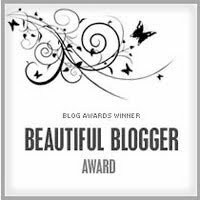 A Beautiful Blogger Award. Isn't a beautiful award? I love the swirls up on the top corner. Thank you Helen for this wonderful award! If you like Quilling you must visit Helen's blog. She does amazing Quilling on cards. Happy Monday, everyone! Here is card I made for the Mojo Monday 139 Sketch Challenge. Not an easy sketch to do. Looks easy but it was hard for to place everything to fit right. I manage to make 2 of this card though. Now I'll have them on hand when I need a masculine birthday card. Making masculine card is always a challenge for me especially most of my stamps are flowers. Hello, everyone! It seems like forever since I stamp and this purse that I made have no stamping on it at all. Gotta get stamping. This is the same purse style as the Greenhouse Garden purse (tutorial here) but only higher/taller. I drew the dotted lines on the purse flap with a white gel pen to match the ribbon. The flap is held down with Velcro. Didn't do a good job drawing the lines in. Should have use a template. Oh, well! What do you think of this purse? I love it! There are so many possibility you can decorate this purse. You can even put treats in there to give to away as a gift. Well, gotta run. Today is my 14th year wedding anniversary but we are not doing anything special. DH have work and tonight we are having a Sunday School Bus meeting. Guess we'll have to celebrate it another day. 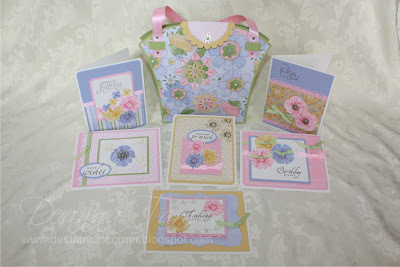 This tutorial comes with step-by step instructions to make the cards and the purse. Click on the button below to get the tutorial delivered to your inbox within 24hrs of payment. Wow! The responses for the blog candy are so over whelming! Thank you all so much for visiting my blog! Hope you all had fun visiting all the blogs along the tour! There were so many fabulous creations to see! Here are the 5 winners for the Greenhouse Garden Tutorial. Congratulations to all! Please email me your email address and I'll email the tutorial out as soon as I can. Dolores~CraftyD's Creations said... Gorgeous cards, love that purse too. Certainly would make a fabulous Mother's Day gift. Betty said... Lovely purse and card set! I love the flowers on them! jmniffer said... Wonderful set of cards, they would make a super gift. I've just ordered this set and would enjoy having your tutorial to recreate what you have done. Thanks for the chance to win it. Thank you for stopping by today. Come back often and visit! The Greenhouse Garden tutorial is for sale if you would like buy it. I'll have a post ready with a button to click on to buy.